If you’re anything like me, you’re really good at one thing: being a bad daughter. Mother’s day was over a week ago, so this post AND her mother’s day present (separate items – I don’t consider a post a “present”) are over a week late. But if your mom is anything like mine, she’s really good at a lot of things. Including enjoying presents and posts even if they’re late. My mom is the reason I started to cook. She had the fantastic rule that every kid had to either help make dinner or clean up afterwards. I chose cooking and grew up learning my mother’s (and grandmother’s) recipes. Choosing to cook was a decision I’m glad I made. I mean, WHY would you ever want to clean up if you could cook? My brother and sister would say it’s because the clean up took waaaaay less time than the cooking, but their not the smart one’s in my family (heh, heh, did you get my joke? I know my mom did). 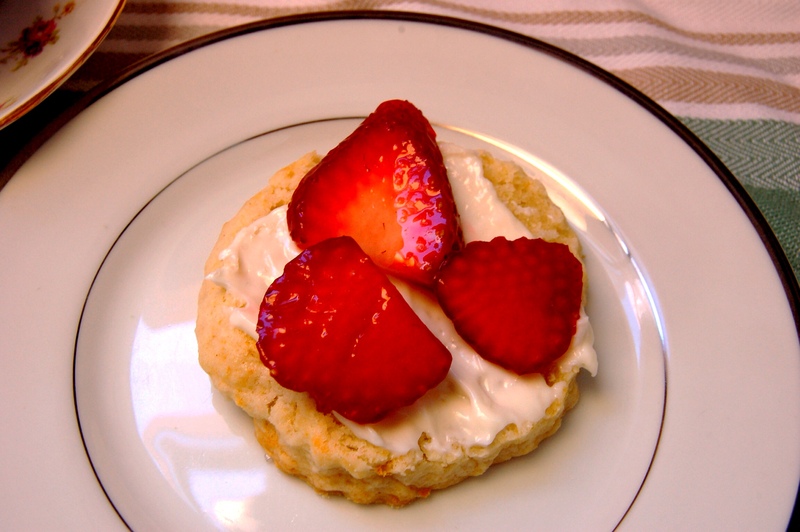 This post is an ode to my mother, who made me my first strawberry shortcake. 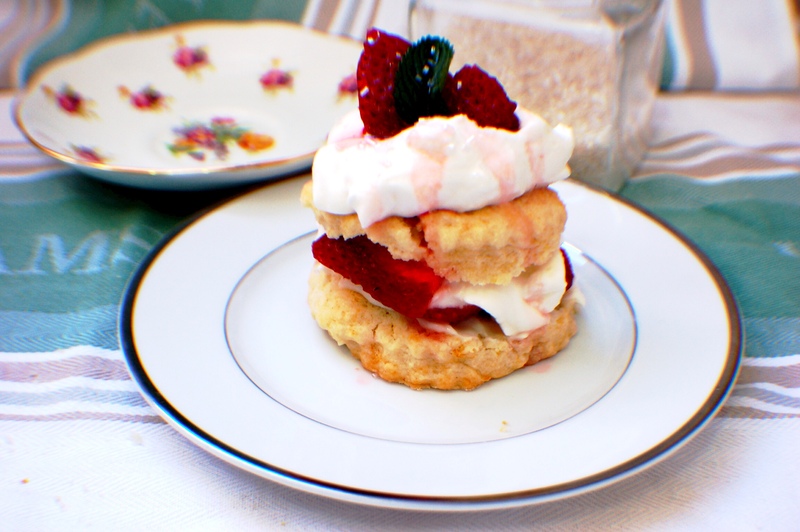 This is similar to her shortcake with a few twists. First, I will take any excuse to add bourbon to a recipe, including “hey this would taste better if I was drinking bourbon.” Second, a little lemon zest because why not. And third, some cream cheese frosting because we’re not here on this post to make something healthy (sorry, Paleo fans). On to the instructions. Oh, and hey mom – thanks for all of the cooking and baking lessons. 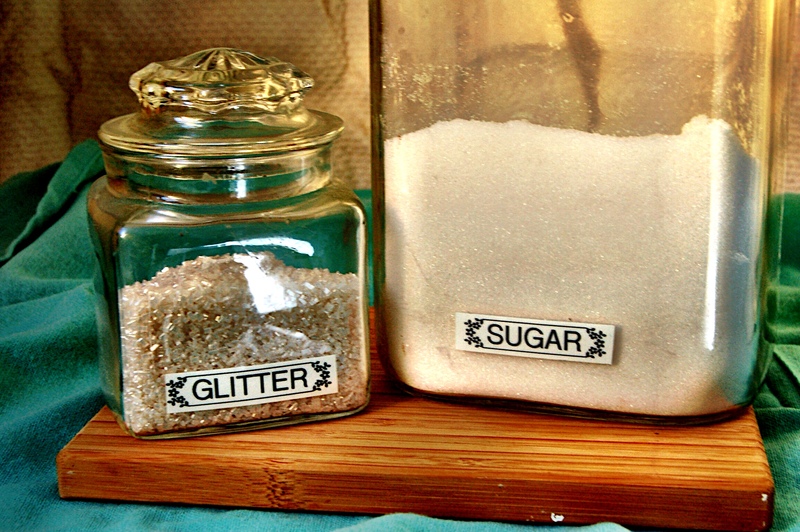 We’ll start with a little bit of sugar and a lot of glitter. 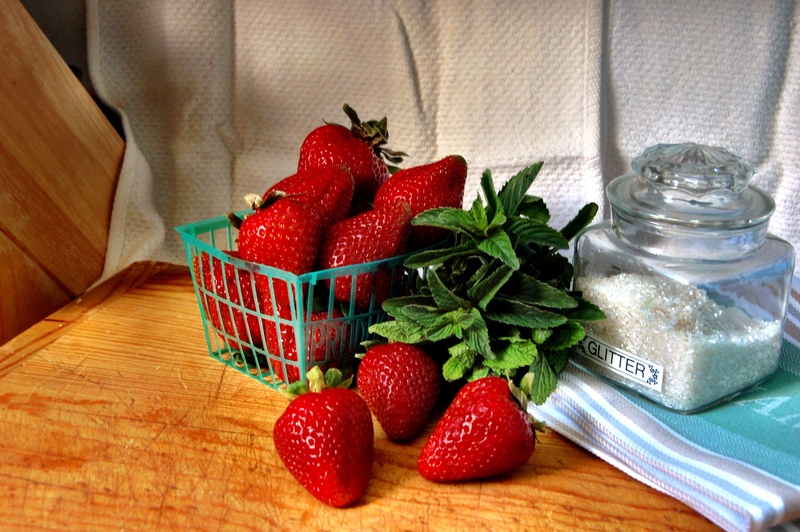 We’ll find some super ripe organic strawberries from the Farmer’s Market. 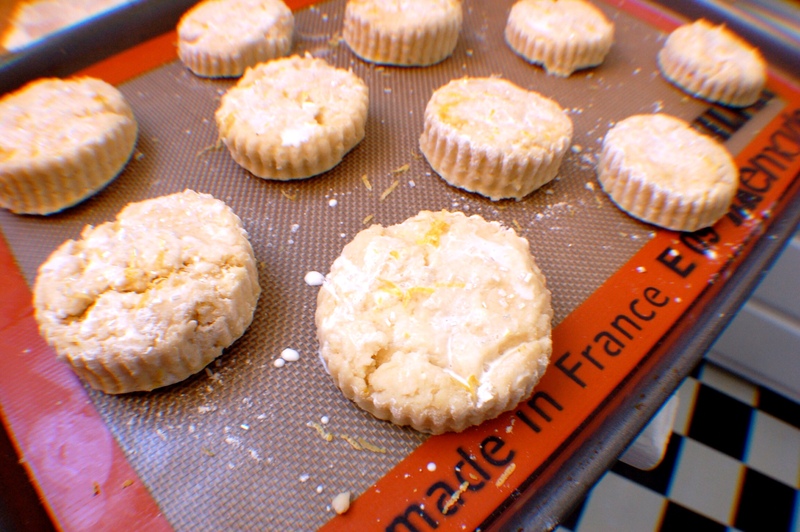 And we’ll bake up some incredibly delicious shortcakes! 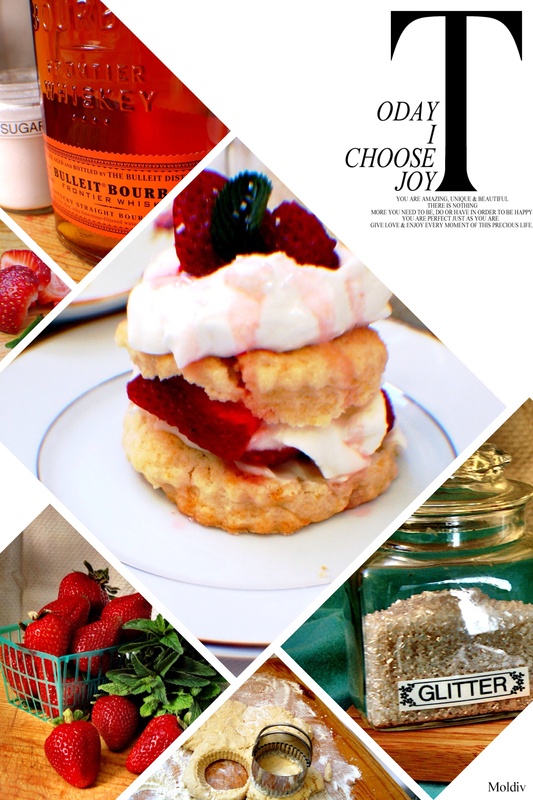 For this recipe, I’ve included an option in the shortcake to add an egg. The egg will make the shortcake fluffier and more cake-like for those of you who like that texture and a taller shortcake. I prefer the flatter, more “cookie”-like version myself. The photos I took are sans-egg. Note: I have one rule about adding alcohol into recipes. Whatever you think is enough: double it. This is already doubled so if you prefer less of a bourbon flavor or no bourbon flavor, you can half the bourbon. Or zero it out (but then everyone will cry and be sad that you made your whipped cream no fun). 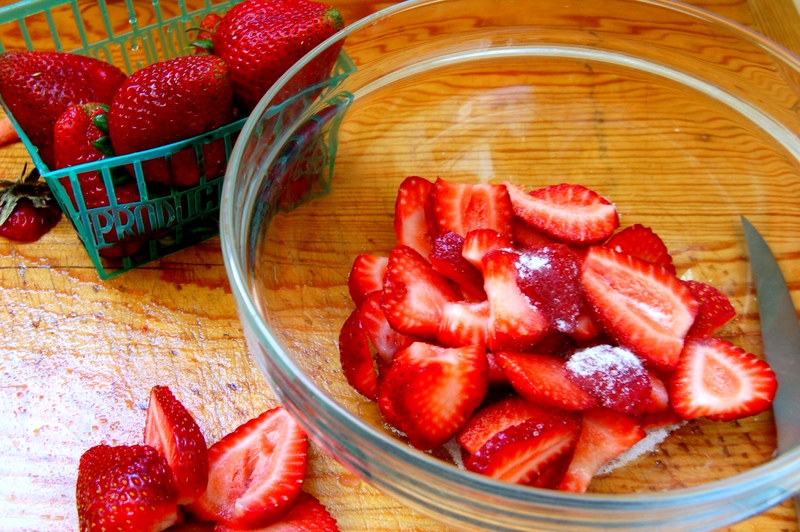 Cut up strawberries into slices (they’ll lay better when you put together the shortcake), mix in sugar. Leave in refrigerator for about 30 minutes to macerate. 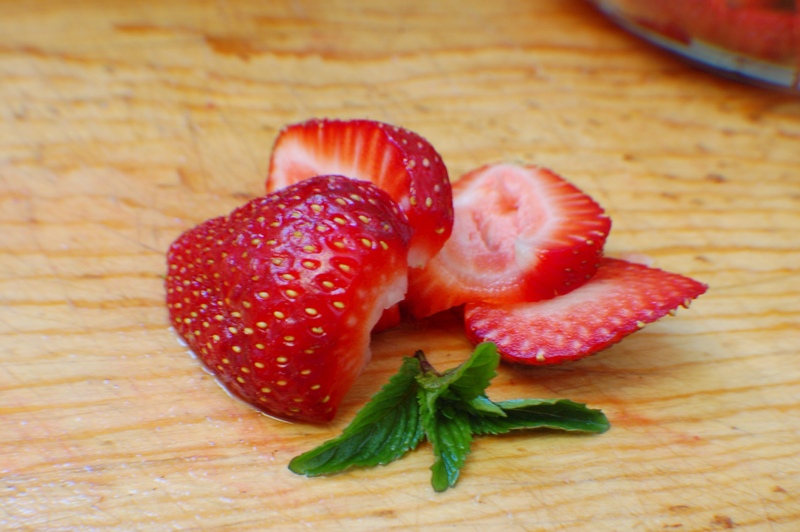 Maceration is a process whereby the added sugar draws out liquids from the strawberries and softens the fruit. And it’s a fun word to say. Maaaa’-ser-ate! Look at me! Maceratin’ and stuff. Keep the butter COLD so it’s flaky in the dough. 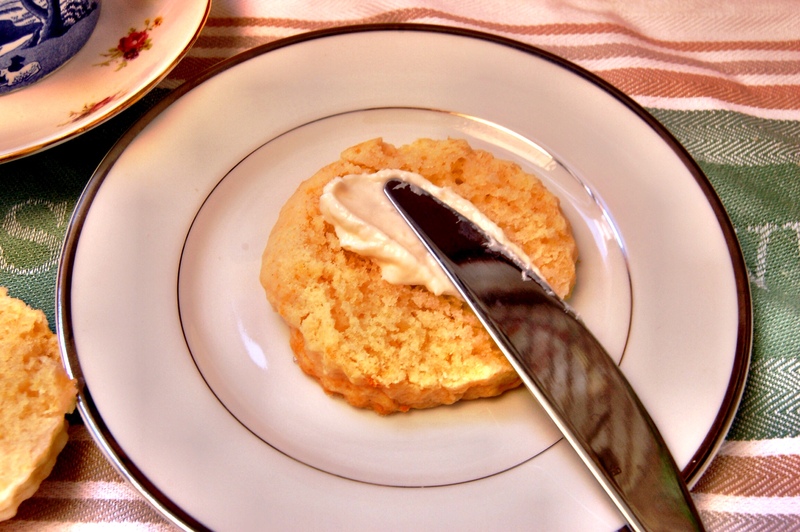 Flaky butter = flaky shortcake! Mix until it looks like oatmeal! 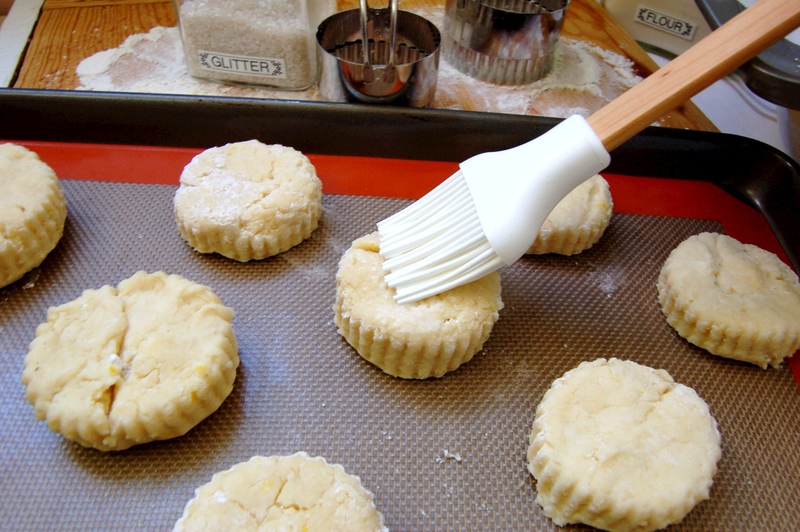 Your fingers will be nice and buttery/floury. Next, add in buttermilk, 1 cup cream, zest of 1 lemon and (optional!) egg. 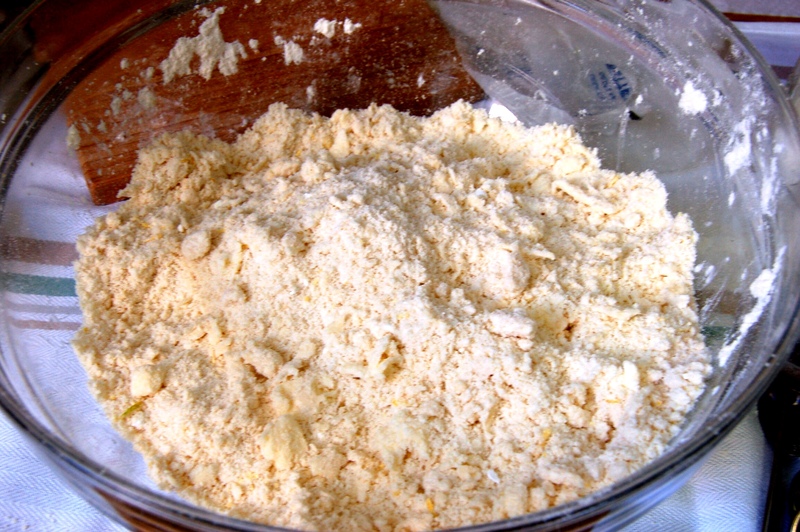 Mix until incorporated, but do not overmix, as you’re trying to keep all that buttery flaky goodness intact. Chill for about 30 minutes so that it’s easy to handle. Now you’re going to “roll” out the dough into 1/2 inch thickness on a heavily floured surface. I don’t actually roll, rather, I kind of smoosh and spread it into 1/2 inch thickness. 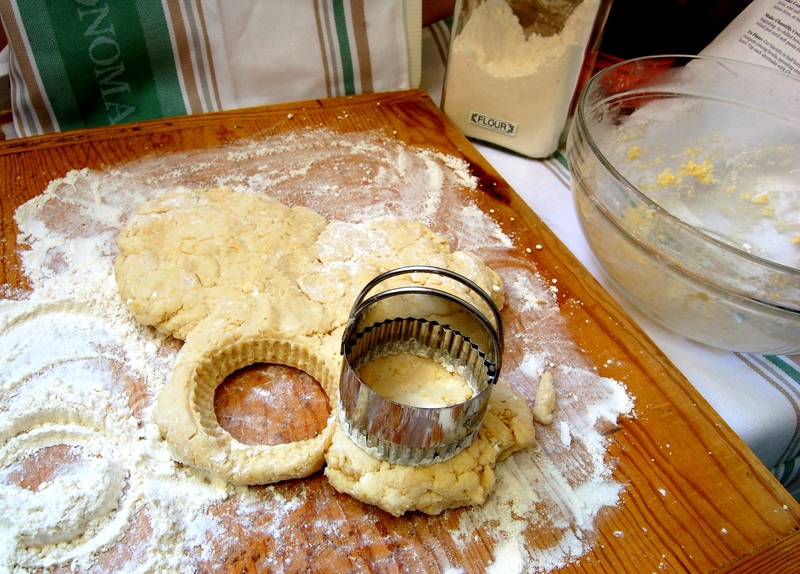 Use a heavily floured biscuit cutter to shape each biscuit. Then, using a silicone basting brush, baste with the remaining 1/3 cup of cream. Lastly, sprinkle with remaining zest of 1/2 lemon and glitter. Bake for 15-18 minutes until golden brown on top. Here are some fancy pictures of those steps. Everything must be heavily floured because this shiz is stickaaay! Zested, glittered, and ready to go in the oven! This one’s easy. Microwave cream cheese for 10 seconds to soften. Mix in sugar. Taste and add in sugar to desired amount. Then probably taste some more. Finally – the assembly! Cut the shortcake in half, spread on cream cheese frosting, arrange strawberries flat, add the other shortcake, more strawberries, whipped cream, drizzle some strawberry juice on top. I mean you know how to do this, right? Now sit back and enjoy the compliments you will receive from your family & friends for this delicious little treat! And don’t forget – call your mom and thank her for all the things she taught you while you were young.